DupScout allows one to keep a user-specified number of reports in the reports directory or the reports SQL database while automatically deleting old reports and freeing up the disk space. These features are especially useful for fully automated duplicate files search operations when the user needs to keep a history of report files in a reports directory or a history of reports in an SQL database. By default, for duplicate files search operations configured to automatically save reports, DupScout keeps the last 100 reports. The 'Keep in Reports Directory' option is applicable to HTML, PDF, text, Excel CSV, XML and DupScout native reports saved to a reports directory or to the user's home directory using the DupScout command line utility. After saving each new report, DupScout will check if there are too many reports of the same type in the reports directory and delete old reports according to the user-specified configuration. The 'Keep in SQL Database' option is applicable to reports submitted to an SQL database using the DupScout GUI application or the DupScout command line utility. After saving each new report to the database, DupScout will check if there are too many reports from the same host computer, for the same set of disks or directories and delete old reports according to the user-specified configuration. For example, if reports from two different servers are submitted to the same SQL database, DupScout will keep in the database X last reports for each server. The 'Excel CSV Reports Delimiter' option allows one to specify a custom Excel CSV reports delimiter. By default, data fields in Excel CSV reports are delimited by the comma (,) character. But, the comma (,) character is a valid file name character and therefore file names with the command character will span multiple data fields in CSV reports. In order to properly export such file names to Excel CSV reports, the CSV field delimiter should be changed to the 'Tab' character, which is not allowed in file names, but still recognizable by Microsoft Excel as an optional data field delimiter. The 'Report Files Date Format' option provides the ability to customize the date format used in all types of duplicate files reports. In order to enable sorting of duplicate files by the last modification date in Excel datasheets, the date format should be set to YYYY-MM-DD. The 'Save File Categories' option allows one to enable/disable exporting of file categories to HTML, PDF, text, Excel CSV and XML reports. Second-level file categories are available when reports are manually saved using the DupScout GUI application or DupScout Server client GUI application. Automatically generated reports or reports saved using the DupScout command line utility always saved without file categories. 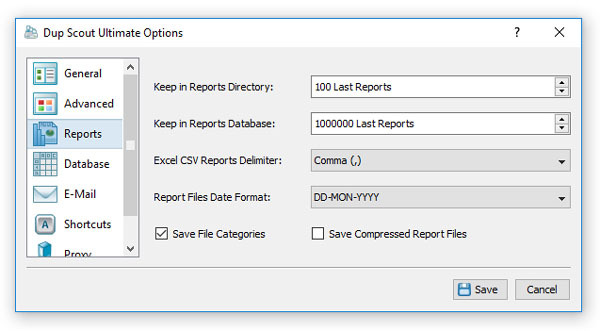 The 'Save Compressed Reports' option allows one to save automatically generated HTML, text, Excel CSV and XML reports as compressed GZ archive files. PDF Reports and DupScout native reports are always saved in a compressed form.